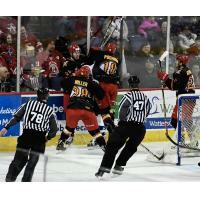 The Royals outscored the Americans 3-1 in the third period handing Allen its third straight loss. Josh Atkinson scored his first of the season on Saturday night scoring shorthanded. Gary Steffes had an assist for the second game in a row, and now has two points in two games since his return. Allen was outshot 14 to 4 in the third period. Zach Pochiro is tied for the league lead with 26 goals. Riley Bourbonnais has 6 goals in his last 11 games. Rookie Alex Breton is seventh in the league in Defenseman Points with 31. Zach Pochiro is tied for second in the league with 11 power play goals. *CJ Motte is fourth in the league in minutes played with 1,913. Chris McCarthy leads the Royals with 54 points (14 goals and 40 points). Josh MacDonald leads Reading with 19 goals. Frank DiChiara leads Reading with 6 power play goals. Chris McCarthy has 3 goals in his last two games. Chris McCarthy leads the Royals in assists with 40. The Americans have dropped three straight games, and have just one win in February (1-4-1). Allen is 6-14-1-0 on home ice this season, which is the fewest home wins in the league. Greenville is second with 8. Reading is 12-8-1-3 on the road this season. Allen is 10-5-4-1 when scoring the first goal of the game. Allen is 0-5-0 against the North Division. Allen's power play at home ranks 13th overall in the league at 81.4 %.